The Cook County Land Bank Authority is racing into large-scale mixed-use developments, and as its first project will take on a crumbling bank that’s loomed vacant over the Cottage Grove Green Line stop in Woodlawn for 20 years. 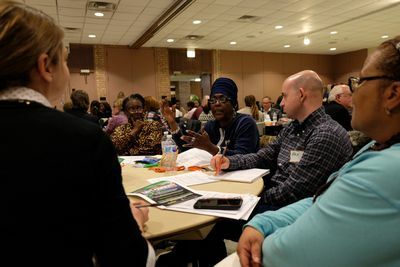 The Washington Park National Bank, 6300 S. Cottage Grove Avenue, is the Land Bank’s chance to prove it can take on substantial developments, and Executive Director Rob Rose’s wants to go into the first project at a sprint. At a Tuesday night meeting to discuss options for the four-story building with Woodlawn residents, the Dallas-transplant billed himself as a man of action. Rose said he wants to get ideas from residents over the winter so he can start soliciting proposals from developers by April and break ground in the summer. “By this time next year, if we’re not complete, we want to be darn near complete,” Rose said. 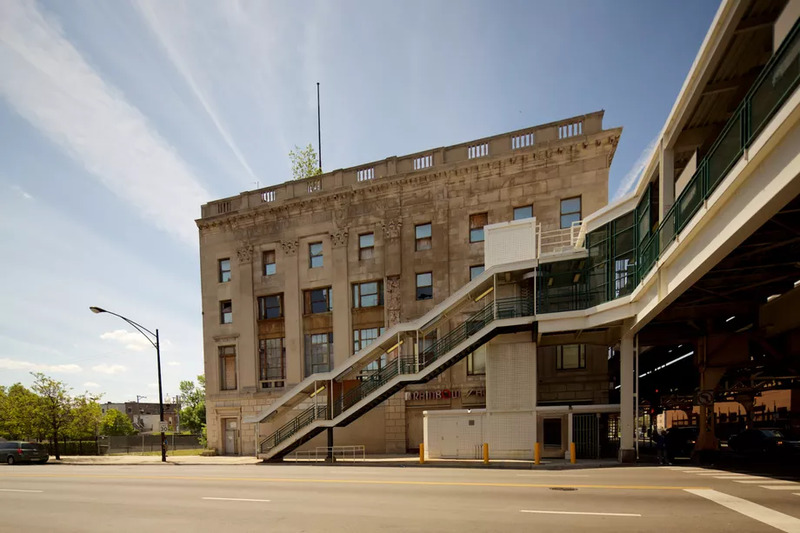 By comparison, it took the city 12 years to find a developer for the nearby Strand Hotel, 6315 S. Cottage Grove Avenue, after snatching the five-story building up at a tax sale in 2002. The Land Bank has moved surprisingly nimbly at times since forming in 2013, but the pace Rose wants to hit is aggressive for any large government-owned property, especially one that has been so badly scarred by Woodlawn’s turbulent real estate market over the last 94 years. The limestone cladding designed by architect Albert Schwartz has fallen away in sections, burnt out shop signs cling to the walls and a maturing tree is clearly visible growing out of the roof. Inside, the scene is much worse. Rose said a skylight that once illuminated the main lobby of the bank has collapsed, leaving the interior open during the winter. He said engineers are still trying to figure out why the basement keeps filling with water, which then freezes when temps drop. But the Land Bank wouldn’t have been able to acquire the bank if it hadn’t been neglected. Though once the home of The Woodlawn Organization, the powerful community group founded by Saul Alinsky, the group’s long-time leader, Rev. Leon Finney Jr., has allowed the building to languish. In December, the Land Bank was able to take control of the building because it had racked up $3.7 million in unpaid taxes over the last 20 years. “We are going to save this building,” Rose told neighbors, minimizing demolition as an option. But he admitted the engineering studies aren’t finished, and though initial results show the steel structure of the building is stable, there are outstanding questions about water damage in the basement. Rose said he won’t have any financial resources to offer a developer that wants to take on the project, but he can smooth the runway for takeoff by clearing away years of liens on the title and connect developers with state and city tax credits like the Woodlawn TIF District. Right now, the Land Bank is trying to figure out exactly what kind of developer they should be looking for. In a quick poll of the audience Tuesday night, more than half of people wanted the 35,000-square-foot bank to become some mix of entertainment, office and business incubator space. There are two more meetings on Feb. 6 and Feb. 20 to nail down a more specific vision. But Rose said he wants whatever developer that takes on the bank to be focused on the needs of Woodlawn now and isn’t interested in developers that want to try to surf on a wave of property speculation brought on by excitement around the Obama Presidential Center in nearby Jackson Park.